If you’ll be attending the If:Gathering at my home church this weekend, you’ll be able to taste this simple and absolutely scrumptious oatmeal and blueberry breakfast cake. Lately, I’ve been using a high extraction einkorn flour to my hearts delight. I decided to use it for this breakfast cake which gave it a slightly sweetened nutty flavor. The flavor of the flour developed beautifully with rolled oats. To gently sweeten the cake, I used honey, my natural sweetener of choice, and added frozen blueberries that I picked last summer with my boys. It turned out gently sweetened, a bit nutty, and, oh… so moist. To make this breakfast cake something to be remembered I made a topping of coconut palm sugar, butter, cinnamon, and a bit more flour. I need to hurry off to the kitchen to continue preparing food for this weekend’s webcast gathering but before I do I wanted to leave you with the recipe for this oatmeal and blueberry breakfast cake for those of you that can’t attend. I’m sure your family will love it! 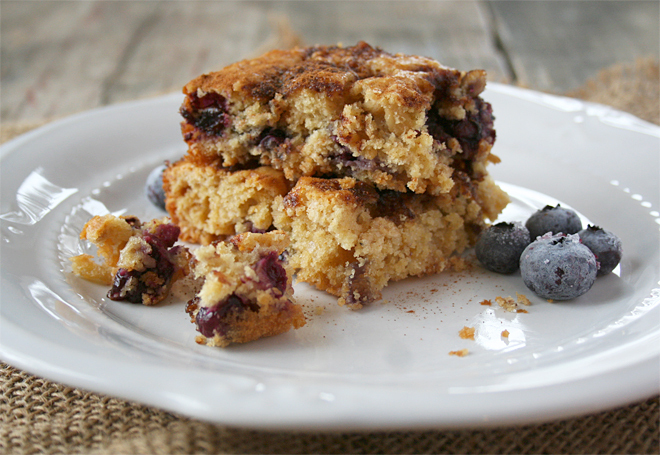 Oatmeal and Blueberry Breakfast Cake – Naturally Sweetened, Einkorn Flour. This breakfast cake is gently sweetened, a bit nutty, and, oh... so moist. In a large bowl, mix together the flour, rolled oats, baking powder, and salt. In a separate bowl, mix whisk together the honey, coconut oil, milk, and egg. Using a mixing spoon gently mix in the wet ingredients into the dry ingredients until just mixed through. Do not overmix. Once mixed together, mix in the blueberries until just mixed in. In an 11 x 7 parchment lined baking sheet, add the batter and spread it around to fill the baking sheet. With a fork, quickly mash together the flour, coconut palm sugar, cinnamon, and butter into small pieces. Sprinkle the topping over the batter and bake the breakfast cake at 375F for 20-25 minutes rotating the baking sheet half way through the baking time. Do you serve your family breakfast cakes or muffins for breakfast? We don’t usually, but I’d love to have some more recipes to add for our special breakfast days. Do you have a favorite breakfast cake or muffin recipe you can share with us? Thanks!! Use the coupon code HumbleK and you’ll get 10% off plus free shipping until March 1st. You can definitely substitute the einkorn flour for regular all purpose, sub the coconut palm sugar for brown sugar and the coconut oil for butter. Your oatmeal blueberry cake sounds amazing but I don’t have einkorn flour. Can I use wheat flour instead? Yes, you can sub regular all purpose flour for the einkorn. What other type of flour could be used besides the high extraction einkorn flour? You can sub regular all purpose flour for the einkorn. Sounds fantastic….making this for Saturday breakfast! Loved the 25 days series, very well thought out. Beautiful! 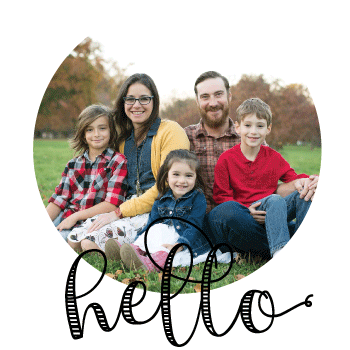 You are becoming an expert in Einkorn! This looks amazing! Blessings, sweet friend! That was absolutely delicious!! Thanks so much for preparing the food for us! I had a great time. My hubby wants this tomorrow. I don’t have einkorn, but I have some soft white wheat berries I’ll grind up. My mouth is watering, and I’m still full from today! We eat muffins and breakfast cookies several mornings a week since we have to get on to our schooling or out the door to an activity. Our favorites are applesauce muffins, cinnamon muffins, chocolate chip muffins, banana bread chocolate chip bars, chocolate chip breakfast cookies… Do you see a theme? 🙂 I like to make double batches so I have enough to freeze. My 4 year old and 6 year old sons can eat 3-4 muffins each! Thanks for this recipe – I think it will be on our table tomorrow morning! This recipe looks and sounds amazing! I’m curious, why do you not worry about soaking the flour/oats? This cake looks delicious and moist with crumb! I may have to add it to my repertoire! Is this einkorm flour similar to kamut khorasan flour which we can get in the UK. I like that ancient flours are much higher in protein and trace elements. Has anyone else made this recipe? I made this cake this morning and it tasted good (although i would cut down on the honey next time) but looked nothing like the picture. Mine was more like baked oatmeal texture. Should it be firmer than that? It was really liquid going into the oven and there was no way, even after baking an additional 5 mins that I could cut squares like above. We spooned it out. It had a delicious taste although a little too sweet for us, so I was thinking either increasing flour or decreasing milk next time. Anyone else have this problem? Thanks! That’s really odd, Denise. Did you follow the recipe exactly? 1. Preheat oven to 350`F. 2. In a large bowl, mix together the dry ingreds. 3. In a separate bowl, mix whisk together the wet except berries. 4. Using a mixing spoon gently mix in the wet ingreds into the dry ingreds until just mixed through. Do not over mix. 5. Once mixed together, mix in the blueberries until just mixed in. 6. In an 11 x 9-inch buttered Pyrex baking dish, pour the batter. 7. Bake at 350F for 40-55 mins or until when pressed it’s firm to the touch in middle of dish.